An acclaimed novelist writes about the unique joys of a good bookstore. Suzanne Shea has always loved a good book-and she’s written five of them, all acclaimed. In the course of her ten-year career, she’s done a good bit of touring, including readings and drop-ins at literally hundreds of bookstores. She never visited one that wasn’t memorable. Two years ago, while recovering from radiation therapy, Shea heard from a friend who was looking for help at her bookstore. Shea volunteered, seeing it as nothing more than a way to get out of her pajamas and back into the world. But over next twelve months, from St. Patrick’s Day through Poetry Month, graduation/Father’s Day/summer reading/Christmas and back again to those shamrock displays, Shea lived and breathed books in a place she says sells’ideas, stories, encouragement, answers, solace, validation, the basic ammunition for daily life.’ Her work was briefly interrupted by an author tour that took her to other great bookstores. Descriptions of these and her memories of book-lined rooms reaching all the way back to childhood visits to the Bookmobile are scattered throughout this charming, humorous, and engrossing account of reading and rejuvenation. 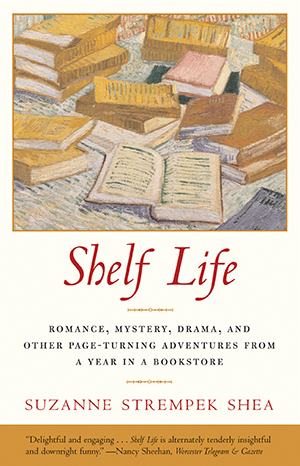 For anyone who loves books, and especially for anyone who has fallen under the spell of a special bookstore, Shelf Life will be required reading. "Delightful and engaging . . . Shelf Life is alternately tenderly insightful and downright funny." "Shelf Life has much the same feel as a browse through a bookstore; the digressions, the snippets of conversation, the lure of new titles and the possibility of something that could change a life." "Those of us who think bookstores and libraries are the two best places in the world will enjoy this book by Suzanne Strempek Shea . . . Shelf Life is pleasant, amusing, and sometimes passionate. By the time I finished reading, I was ready to go hunt a bookstore job for myself." "Shea describes authors' readings-including her own-that, even with sometimes squirmingly small audiences were exhausting, gratifying, quirky fun. With one foot in book-writing and the other in book-selling, Shea champions authors, especially local ones, and celebrates the excitement that radiates through the stores as flesh and book make contact."